Is there a better alternative to HIIT Workout? Is HIIT Workout really the best app in Health and Fitness category? Will HIIT Workout work good on macOS 10.13.4? HIIT Workout...High-Intensity Interval Training is a cardiovascular workout designed to enhance fat loss with short periods of intense activity. A typical workout consists of six to ten repetitions of high intensity exercise, separated by longer intervals of medium intensity exercise. You can perform them by sprinting, cycling, rowing or with any other form of cardiovascular exercise. HIIT Workout needs a review. Be the first to review this app and get the discussion started! HIIT Workout needs a rating. Be the first to rate this app and get the discussion started! Traditionally a stopwatch or timer is used, however this makes it hard to listen to music while you work out. HIIT Workout solves this by taking songs from your iTunes library, joining them together and overlaying series of beeps and prompts to help you time your workout. In this way you can listen to music while you perform your workout. Workouts are fully customizable with intervals lasting anywhere from five seconds to two minutes in length. You can use music, podcasts, or any other audio items in your iTunes library. 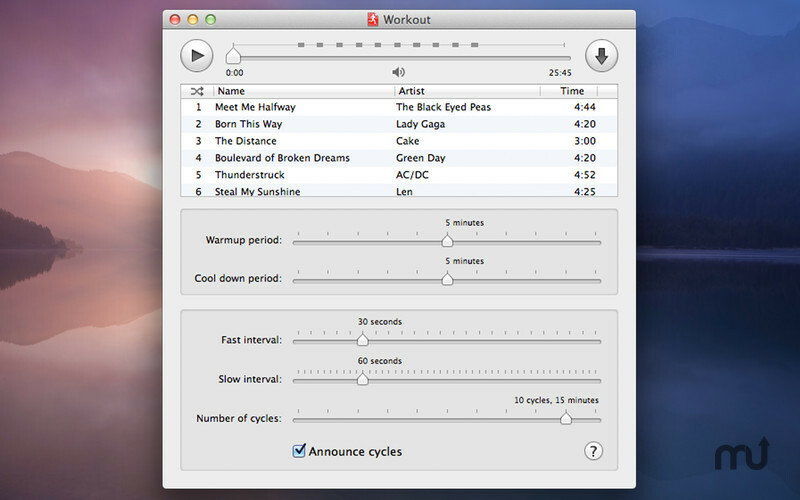 Simply add your songs, configure your workout and export to iTunes. You can then add the audio workout to your portable media player, or play it straight from the app. Note: Songs purchased from the iTunes Music Store prior to January 2009 may contain Digital Rights Management (DRM) encryption and cannot be used. Sorry.